Go! 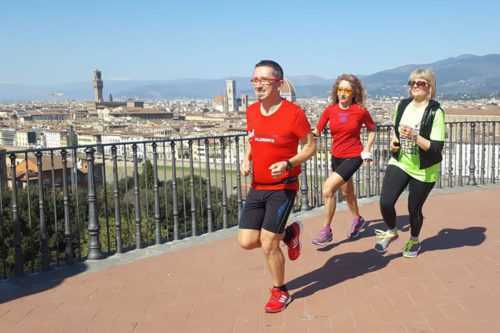 Running Tours in Italy show you this beautiful Mediterranean country while you get a great workout. And going at a quicker pace, you can pack much more into your trip. So bear in mind the extra hour at the vineyard as you float on past the walking tours. With a local guide, you get to capture the pure essence of la dolce vita. Our guided runs cover all of the unmissable sights, as well as some secrets that the locals like to keep. Your tour is on your terms, so you can stop for a photo, ask questions and much more. Whether you’re after food, nature, history or art, Italy has it in abundance. So peruse our running tours in Italy for one that really grabs your attention and join us! (Just don’t forget your trainers). A lifetime isn’t long enough to visit all of the destinations Italy has to offer. Venice and its canals, Florence and its Renaissance glory, Milan with its effortless style and the open-air museum of Rome. And that’s only some of the major cities. The port town of Genoa is a wonderful gem that has a lot on offer without the queues. Similarly, the Amalfi Coast and nearby islands such as Capri are great alternative locations for running tours in Italy. The laid-back vibe, year-long great weather and deep blue waters are impossible to resist. Italian cuisine needs no introduction. This is a place where simplicity reigns supreme. Quality ingredients blended together well is all you need. Whether your a pasta or a pizza person, a red or a white wine fan, Italy will never get old. Its artistic flair goes well beyond the kitchen and onto the canvasses, walls and notebooks around the country. Nothing impresses more than frescos by Michelangelo, da Vinci and Botticelli, except when you think about how they painted them in the first place. Italian music, theatre and opera breathe class and you can’t help but feel that little bit more sophisticated on seeing one. The stunning beauty you see today all has its roots somewhere. Italy’s history from the Romans onwards has always had one eye on the artistic. Perhaps the slow, Mediterranean pace of life leaves time for care and consideration in the Italian people. You can get one step closer to finding out this link with our running tours in Italy. Not only will your knowledgable private guide show you sights such as the leaning tower of Pisa and the Colosseum, but also the myths, legends and values that pin the society together. So leave the extra hairdryer and pack your trainers. Go! Running Tours in Italy will ensure you an unforgettable experience.